Every Friday I promise to take the kids out for only an hour. I’m supposed to have them back at 1:30 at the latest. I know better, however. On a beautiful day like it was today, it is impossible to accomplish. Especially when I am accompanied by six very excited kids who want to see what is just around another corner. It is very difficult to say “time’s up”. For a couple of months, my students have been hopeful that we’ll see a killdeer. They were intrigued by a description of its behaviour that I read to them before Christmas and enjoyed listening to its distinctive call on the computer. Well, today we finally heard its call for real and spent a good half an hour following a couple of pairs. 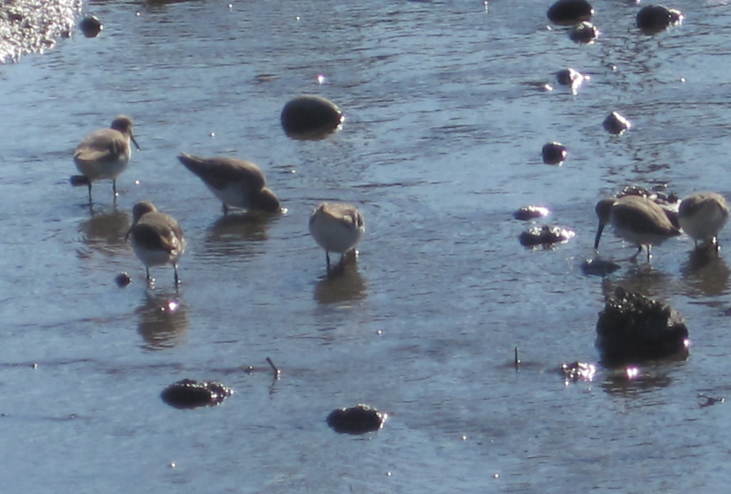 We also saw approximately 50 Western sandpipers (also a first for us on the Inlet) and watched them as they slurped up the mudflat slime that Dr. Ydenberg told us they love so much. We saw a pair of downy woodpeckers (perhaps the same one as the last couple of times), a great blue heron (also possibly the same one we have seen off and on since our first birding visit in December) and a hungry flock of green-wing teals. Interestingly, we saw a iridescent green hummingbird perched on a branch as we returned to the truck. Poor little thing! What would it be doing around here on such a cold day!? Anyway, my group left satisfied that they could return and brag about the birds that we had a chance to see. And once again…no Canadian geese! 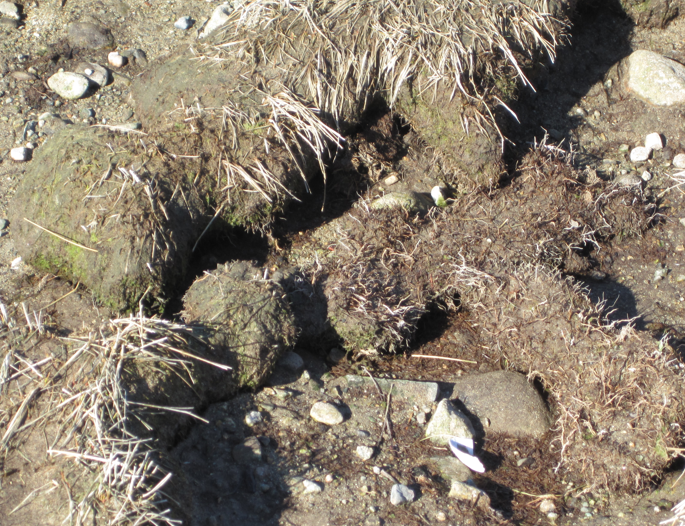 We also got a good picture of the salt marsh eroding away. Under the last remaining balls of roots and soil is stones and fine gravel. Is it dying and washing away with the tide? Or is the nutrient-rich soil washing away first, leaving the plants to die? The water level today was 28cm…the lowest I’ve recorded so far. One of my students checked out the water level during a rainy day a couple of weeks ago and reported a water level of 40cm. It really does fluctuate with the rain!